This new handset features dual AMOLED displays, is powered by Samsung's Exynos 7420 SoC next to 3 GB RAM, and runs Android 5.1 Lollipop. 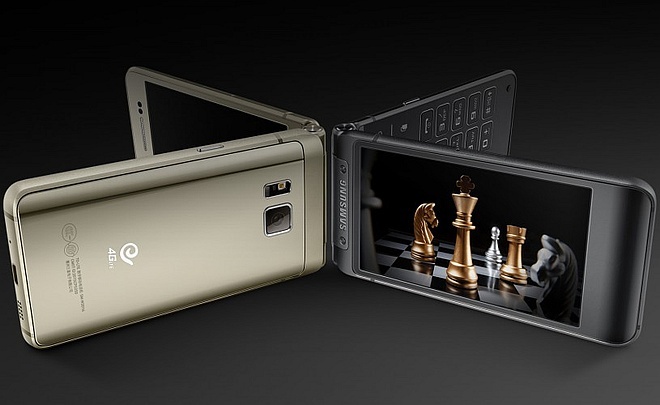 The device formerly known as Galaxy Golden 3 back in the days when it was spotted at TENAA is now official, but its name is less attractive - Samsung W2016. However, the device itself is a stylish, high-end dual screen flip smartphone that uses a metal and glass build, offers dual SIM capabilities, as well as wireless charging. Unfortunately for those interesting, this handset will only retail in China, and its price on that market is around $1,565 USD. Remains to see when and if they decide to launch it internationally, because the W2016 surely has the looks, although its price will be hard to swallow by most fans of the classic clamshell design.